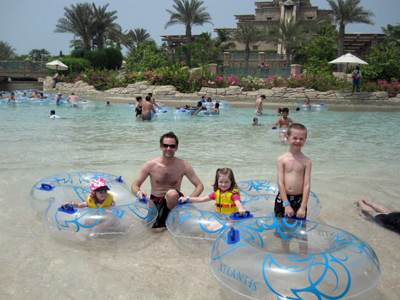 On August 12th my family and I traveled to the Atlantis The Palm Hotel in Dubai located on the famous Palm Island. This has been on our bucket list of things to do for some time. The kids really had no idea what to expect, and admittedly, I only had a slight idea gathered from pictures on the Internet. My heart was racing just as much as theirs…I felt just like a kid. 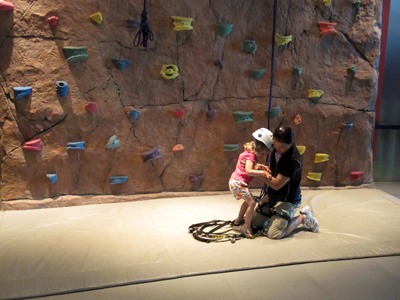 Being that the UAE loves families, and Ramadan offers many discounts for families, we were able to take advantage of a wonderful package allowing us a hotel room, unlimited Aquaventure park access, and unlimited Lost Chambers access. As we neared The Middle East’s largest water-themed attraction, we first had to drive through the under ocean tunnel. I don’t think the kids quite believed that we were actually under the ocean…at least not until we came out and they looked back! The island is beautiful…ocean for miles and miles, beautiful buildings, lush greenery…just the drive up the hotel alone was worth taking. 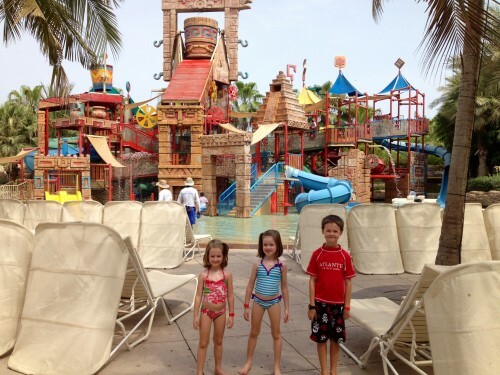 Atlantis boasts 1,539 rooms, sits on 113 acres of land…42 of which is dedicated to the water park! Immediately inside the lobby was another “bucket list” item I had always wanted to see…an original Chihuley! Right there, towering over the lobby is the 32ft high sculpture with over 3,000 pieces of coloured blown glass said to have taken almost two years to create. 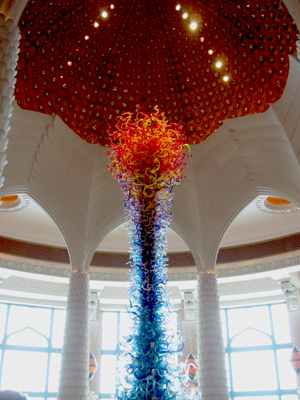 This is Dale Chihuly’s first installation in the Middle East. It is breathtaking. Every other detail of the lobby, from the floor to ceiling windows overlooking the pool to the beautiful architecture of the columns, to the pleansantries of the staff was impeccable. 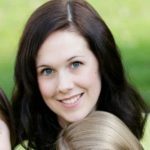 You really felt like you were at a 5 star resort…and one that actually LOVED children. After check-in, we were escorted to our lovely room, at which point we quickly changed our clothes and headed out for some fun! The Aquaventure park was calling our names! You might be wondering how on Earth we could spend an afternoon in the 100% humidity on top of soaring temperatures, but once you’re in the water, you don’t feel a thing. There was so much to explore, we didn’t know where to start. The kids were just ready to get wet! We plopped out towels and bags on a lounge chair and headed for the rapids in the lazy river. I had no idea how big the rapids would be, or even if my little ones would like it, but we needed to get very wet, very fast. So, in we went into big double person tubes and set sail. SO MUCH FUN! My kids, 3, 5 and 6, were laughing the whole way. There are some pretty big rapids moments, and they loved it all. We even soaked them under the waterfalls…no complaints with all that water coming down. After the rapids, we made our way to the children’s playground area. Here you’ll find endless fun with two huge water tipping buckets, climbing structures and rope bridges leading to loads of water slides, and water cannons! We could have stayed here for hours, but we knew we’d be back the next day. Our last stop in Aquaventure on day 1 was the Shark Attack slide where my son and my husband journeyed through dark tunnels and ended in the middle of the shark tank in a clear viewing tunnel. The last slide was left for my husband alone…he did the Leap of Faith slide, 88 ft. high…he survived. One of those things you have to do. After a few hours spent at Aquaventure, we were now on our way to the Lost Chambers where we took a Back of House tour. 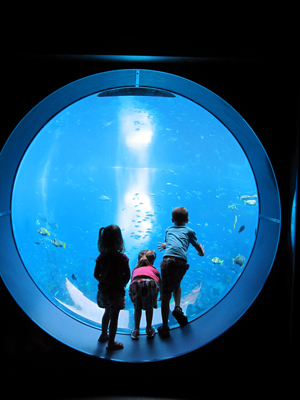 I thought my kids might be too young for it, but we wanted to see how this 11 million gallon aquarium maintained itself, being salt water fish enthusiasts ourselves. It is said to have around 65,000 marine animals. Our tour took us to the behind the scenes areas where we fed the fish from roof above the largest tank, we saw the kitchen where the food prep happened, we saw the hospital for fish who were newly obtained and waiting for tank transfer and those who were sick or injured, and then we saw the pumps and machinery required for mainting the Chamber tanks…absolutely incredible. If you have your little salt water tank at home and think your filtration system is impressive, come take a look at this one! After the tour, we decided to stay in the Chambers and visit all the displays. 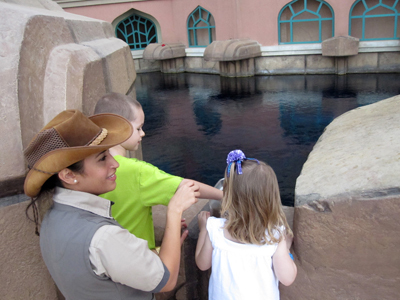 The kids loved all the treasures in the tanks and all the mystical structures in the chambers. There’s even a main tank viewing room to lounge and relax in for a bit. After enjoying the Lost Chambers, we were off to our fine dining experience! How often do you get to eat at award winning restaurants? 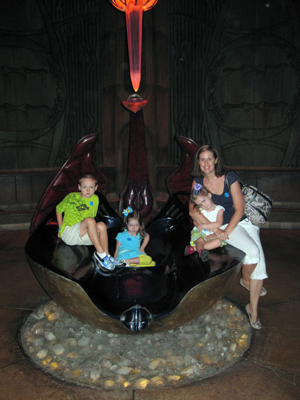 We figured one at the Atlantis had to be good and worth our while. So, off we went for a lovely family evening out at Ronda Locatelli, winner of ‘The Birra Moretti Best Authentic Italian Restaurant Awards’ for Middle East and Africa. This was a lovely authentic Italian restaurant built around a large central wood-fired brick pizza oven. We savoured dishes such as shrimp risotto, a devine strip loin cooked to perfection, three margharita pizzas, calamari, and some nice refreshing juices. For dessert we indulged in sorbet and gelatto. Everything was cooked to perfection, the atomsphere was very inviting and family friendly, and the experience was definitely worth it. I still think about how perfect the risotto was…if only I could make it that good at home. ; Lastly is the creative zone where a daily art and craft project is given. There is a morning, afternoon, and evening session at the Kids Club. You can also authorize the staff to take your children outside for beach and pool play under guidance. For the older kids, they can join the Club Rush for ages 13-18. While the kids were in the club, we decided to see more of the hotel to see what it had to offer. There was the Avenues full of high-end shopping, restaurants all over with every type of cuisine, a luxurious spa, nice business facilities, and more. Outside we found a zero entry pool with plenty of room for the little ones to play or for the adults to sunbathe, and the Royal pool with a calming experience. The grounds were imacculate, the staff was pleasant, and there really is enough to do to last a few days if we had the time. Off we went to pic up the kids and head back to day two of Aquaventure. 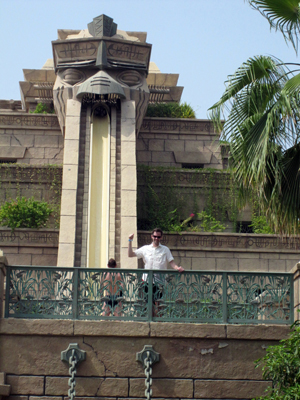 At Aquaventure, the second time around, we let the kids spend a longer time in the playground area, we rode the rapids two more times, we enjoyed lunch being served at one of the many restaurants surrounding the park, and then my son and husband went off to attack the last of the big slides on the Ziggurat. As the late afternoon approached, we sadly needed to say good-bye to the Atlantis The Palm Hotel, and be on our way. We did not want to leave and will surely be back in the future since we call the UAE home now. It’s worth every penny and every memory. Next time, we look forward to doing some of the dolphin encounters as there was just not enough time. 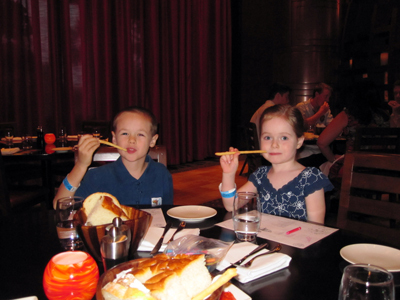 I hope you enjoy every minute at the Atlantis the Palm when you go.